Soybean acres continue to increase. Shorter crop rotations will mean soybean growers have to be vigilant in selecting disease resistant varieties, scouting their crop, and applying inputs when required to prevent crop losses resulting from short rotations. Soybean Cyst Nematode (SCN) can become a problem in short crop rotations; sandy soils are typically more likely to be affected. Soil testing can confirm the presence of SCN and management strategies, such as selecting resistant varieties can be made once the problem is identified. Low soil tests for potash are reducing yield potential on hundreds or thousands of acres every year. Spring planting was sporadic and later than normal in most areas of the province due to poor weather conditions. Late planting and a very hot, dry July hindered vegetative growth so fields looked poor by mid summer. The majority of the province experienced a very good August and September growing period, with adequate heat and moisture for the crop. This made for an astonishing recovery from slow early season growth. The favourable circumstances during the reproductive stages of plant development created a situation where yields were higher than would have been expected. Harvest of the soybean crop got underway slightly later than normal due to the late planting of the crop and rainfall. Harvest was interrupted by a couple stretches of wet weather but was finished by mid-November. Yields were much higher than expected in most areas of the province, with a remarkable provincial average yield of about 45 bu/ac, which would be the second highest yield every recorded in the province. The spring of 2011 was wet and cool delaying field work, in some cases right into June. Corn planting was delayed due to prolonged wet and cold conditions in the early spring. This led to the soybean crop also being delayed. Cool and wet weather continued throughout May. The planting of soybeans was not fully underway until the last week of May and continued well into June. Ground conditions were hard and in many cases too wet when planting occurred. Plant emergence was an issue on heavy textured soils. Emergence of the crop was affected in some areas where planting was too deep, or where heavy rainfall followed shortly after seeding (Figures 1 and 2). 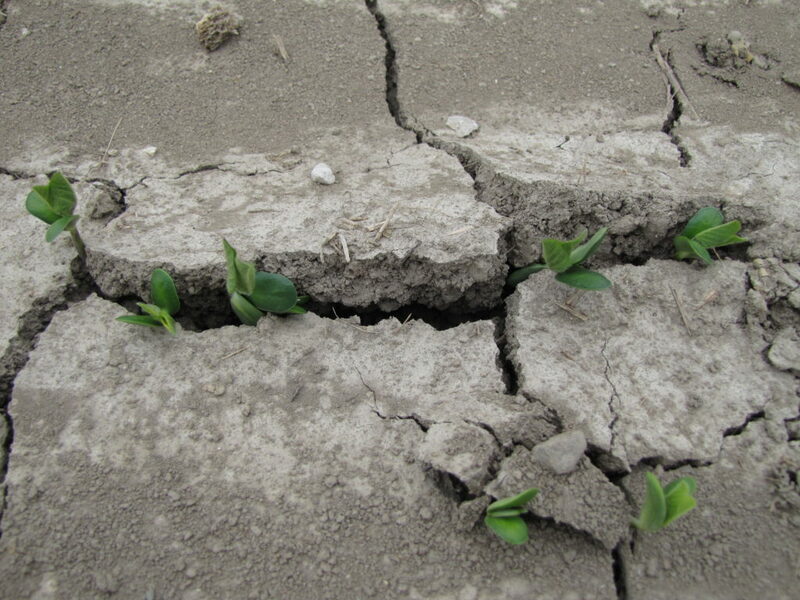 Figure 1: Soil crusting as a result of either soybeans planted into wet conditions followed by the ground drying out or when the soil is worked very finely, soybeans are planted and a hard rain follows. Soil crusting negatively affects the emergence of soybeans. 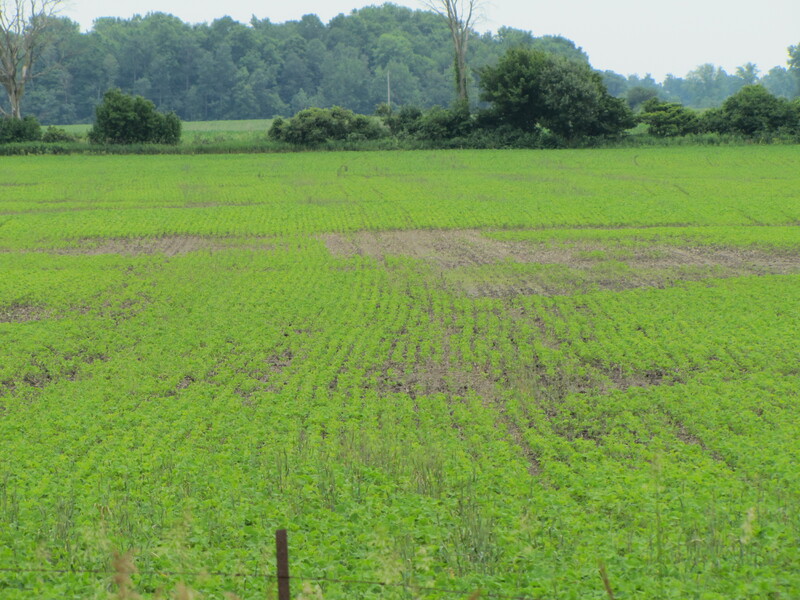 Figure 2: Poor soybean emergence in areas that where waterlogged for a period of days after planting during the wet start to the 2011 cropping season. After the unusually wet spring, the early summer was the complete opposite. In the first three weeks of July most areas in the province received high temperatures in conjunction with near record lows in precipitation. As this lack of moisture and high temperature period coincided with the plant’s vegetative growth and early reproductive development, it led to plants being shorter than normal. The lack of moisture at this stage led to painfully slow growth. By the end of July many fields were in tough shape. Fortunately rainfall came in time for a complete recovery. The period of August and September had nearly perfect weather conditions; as this period of time coincided with the plant’s reproductive growth stages, the soybean crop was able to make an astounding recovery. 2011 exemplified how the indeterminate growth habit of soybeans allows the crop to take advantage of late season favourable conditions. The 2011 crop matured about 1 week later than normal. Soybean pest and disease levels were lower than normal for the bulk of the province. Aphids were reported in a few counties, with spraying taking place in some locations. Most of the province did not report aphids in high concentrations this year. Bean Leaf Beetle and Japanese Leaf Beetle caused some defoliation problems that required action in a few fields, but this was an infrequent issue. White mould was not a huge issue this summer. While soybeans had lush canopies late in the season, they typically closed a couple of weeks later than normal and the plants were physically shorter which resulted in more air flow through the canopy and therefore less prevalence of the disease. A lack of moisture during early flowering also reduced the incidence of white mould. Septoria Brown Spot was widespread again this year but is not considered a disease that causes much yield loss. 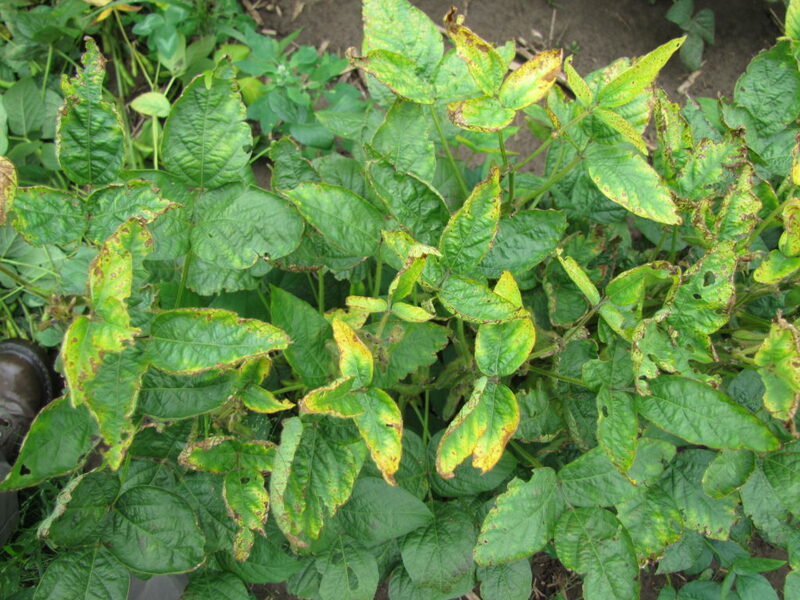 Sudden Death Syndrome (SDS) was reported in areas to the south, as well as sandier soils, because of dry conditions and traditionally higher levels of Soybean Cyst Nematode (SCN). Weeds were a bigger problem than normal for some. Late no-till planting allowed weeds to become established without competition. This was a result of the wet conditions early in the season; it also often led to sprays not being applied during the optimal plant stages, or not being applied at all due to the short working windows of the spring. Slow canopy closure was also part of the problem. Harvest progressed reasonably well, getting underway in early October and progressing through to mid-November. A couple weeks of wet weather during mid-October delayed finishing harvest until November. Yields were reported to be as low as 25 bushels in dry areas affected by SCN to 75 bushels in areas with good moisture and growing conditions. Seed quality was high. Overall, yields were higher than expected in most areas, and the provincial average was about 45 bushels per acre.